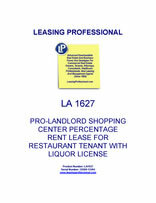 This pro-landlord lease agreement is designed for a large shopping center leasing space to a restaurant tenant who will also have a liquor license. This percentage rent lease has a stepped up minimum rent schedule over the lengthy initial term of the lease. Generally, a fairly long initial lease term is required to amortize the extensive improvements necessary for food service tenants. The lease also contains two renewal option periods for the tenant. The tenant is to receive a construction allowance based upon the amount of square footage in the premises. This product contains a lengthy construction exhibit, plus exhibits for guarantee of the lease, signage criteria, a tenant's certificate confirming the details of the tenant's possession after it occupies the premises, and retail rules and regulations. THIS LEASE (the "Lease"), dated as of the ______ day of ________, 20____ ("Effective Date"), is made by and between COMMERCIAL PROPERTY LANDLORD LLC, a __________ limited liability company ("Landlord"), and AGREEABLE RESTAURANT TENANT, INC., a __________ corporation ("Tenant"). Option Term: Two (2) consecutive periods of five (5) years each. and commencing on the first (1st) day of the thirty-seventh (37th) full calendar month from the Rental Commencement Date and continuing thereafter through the sixtieth (60th ) full calendar month from the Rental Commencement Date, the Minimum Annual Rent shall be: _____________________ Dollars ($___________) per annum. and commencing on the first (1st) day of the seventy-third (73rd) full calendar month from the Rental Commencement Date and continuing thereafter through the end of the ninety-sixth (96th) full calendar month from the Rental Commencement Date, the Minimum Annual Rent shall be: ________________ Dollars ($________) per annum. and commencing on the first (1st) day of the ninety-seventh (97th) full calendar month from the Rental Commencement Date and continuing thereafter through the last day of the one hundred twentieth (120th) full calendar month from the Rental Commencement Date and continuing thereafter through the end of the Lease Term occurring at the end of the tenth (10th) full year of the Lease Term, the Minimum Annual Rent shall be: ________________ Dollars ($_________) per annum. Option Terms: Commencing on the first (1st) day of the first Option Term and continuing thereafter for sixty (60) full calendar months, the Minimum Annual Rent shall be: _____________________ Dollars ($__________) per annum. Exhibit "A": General site plan of the Center. Tenant acknowledges that Landlord may change the shape, size, location, number and extent of the improvements to any portion of the Center without Tenant's consent, and further that Landlord may expand the Center pursuant to Article 29, or withdraw land from the Center without Tenant's consent. Landlord agrees that no change or addition to the Center by Landlord made pursuant to the terms of the Lease shall (except temporarily during repair, maintenance, restoration, refurbishment or construction or except as required by law): (i) reduce parking available to Tenant or Tenant’s customers below the requirements of the City in which the Center is located; (ii) materially and adversely interfere with Tenant’s ability to operate from the Premises; or (iii) materially impair customer access to or visibility of the Premises. Any such change or addition shall be made in a manner consistent with quality shopping centers and reasonable steps shall be taken to minimize any adverse impact upon the Premises occasioned by such change or addition. Landlord reserves the right, in its sole discretion, to change the name, address and logo of the Center at any time. Exhibit "B": Description of the Premises (showing approximate location of the Premises in the Center), the use to which the same shall be put under the terms and provisions of this Lease and the Trade Name to be utilized by Tenant. Exhibit "C": Description of work previously performed by Landlord ("Landlord’s Work") and description of work to be performed by Tenant ("Tenant's Work") in or on the Premises. The Premises shall be constructed in accordance with the procedures outlined in Exhibit "C". Exhibit "D": Guarantee of Lease. Exhibit "E": Form of Tenant's Certificate. Exhibit "G": Rules and Regulations. 3.1 Landlord hereby leases to Tenant and Tenant hereby leases from Landlord the Premises, which Premises are situated within the Center. This Lease is subject to the terms, covenants and conditions herein set forth and Tenant covenants as a material part of the consideration of this Lease to keep and perform each and all of said terms, covenants and conditions by it to be kept and performed. The Premises contain approximately the number of square feet of floor area specified in Section 2.1. Within the thirty (30) days following the date of Landlord's notice to Tenant pursuant to Section 4.1, each party shall have the right, at that party's expense to request Landlord's project architect to measure the exact floor area of the Premises and, if there is a deviation from the number specified in Section 2.1, this Lease shall be amended to reflect the actual floor area and corresponding Minimum Annual Rent and additional rent based on such actual floor area. In the event of such a deviation in floor area, the Minimum Annual Rent specified in Section 2.1 hereof shall be multiplied by a fraction, the numerator of which shall be the total number of square feet in the Premises after the remeasurement and the denominator of which shall be the total number of square feet in the Premises before the remeasurement. The product of the foregoing multiplication shall be the corresponding Minimum Annual Rent. If no measurement is made by either party within such thirty (30) day period the floor area of the Premises specified in Section 2.1 shall be deemed to be the floor area of the Premises. 4.1 Commencement of Term. This Lease shall be effective as of the Effective Date set forth in Article 1 above. The Lease Term shall begin on the Rental Commencement Date and shall continue thereafter for the period of the Lease Term set forth in Article 2 above, unless sooner terminated as hereinafter provided. If the Rental Commencement Date is not the first day of the calendar month then the expiration date of the Lease Term shall be calculated from the first day of the calendar month following the Rental Commencement Date. Landlord agrees to deliver to Tenant, and Tenant shall accept from Landlord, possession of the Premises in its "as is" condition upon notice of delivery of possession from Landlord except to the extent, if any, set forth in Exhibit "C" hereof. Landlord shall have no obligation to perform any work in the Premises, except to the extent, if any, set forth in Exhibit "C" hereof. Within ten (10) days after delivery of possession of the Premises to Tenant under Section 4.1 of the Lease, if Tenant notifies Landlord in writing of specific items of work that Landlord was to perform in the Premises under Exhibit C hereof prior to delivery of possession, Tenant shall deliver to Landlord a list ("Punch List") containing all such items. If such items are Landlord’s responsibility under the Lease, and provided that Tenant or Tenant’s contractors have not altered or modified any of the Landlord supplied equipment or Landlord’s Work, Landlord shall promptly and diligently complete or correct such items. In any event, the delivery date shall not be extended. In the event that Tenant's obligation to pay rent has not commenced within two (2) years from the Effective Date hereof, this Lease shall automatically terminate, and Landlord and Tenant shall be relieved from any and all liability resulting hereunder. Such termination shall be Tenant's sole and exclusive remedy at law or in equity for Landlord's failure to deliver possession of the Premises. For purposes of this Lease, any reference to "business days" shall mean Monday through Friday with Christmas, Easter, Thanksgiving, Memorial Day, Labor Day and July 4 excepted. 4.2 Tenant’s Certificate. Within fifteen (15) days after the Rental Commencement Date and at any other time during the Lease Term, within ten (10) days following request in writing by Landlord, Tenant shall execute and deliver to Landlord a certificate substantially in the form of Exhibit "E" attached hereto indicating therein any exceptions thereto which may exist at that time. Failure of Tenant to timely execute and deliver such certificate shall constitute an acceptance of the Premises and an acknowledgment by Tenant that the statements included in Exhibit "E" are true and correct, without exception. 4.3 Tenant’s Work. Tenant shall commence Tenant's Work promptly following the notice from Landlord referenced in Section 4.1 above. Tenant shall complete Tenant's Work no later than the Rental Commencement Date. During this period, Tenant, at its sole cost and expense, shall perform all of Tenant's Work as set forth in Exhibit "C" and shall equip the Premises with all trade fixtures and personal property suitable or appropriate for the regular and normal operation of the type of business in which Tenant is engaged, and Tenant shall open for business to the public as soon as possible after delivery of possession. In any event, Tenant shall open for business to the public on or before the Rental Commencement Date. If Landlord determines in its sole but reasonable discretion that it is necessary or desirable for any portion of Tenant’s Work be performed by Tenant prior to the Delivery Date ("Early Work"), Tenant shall be permitted to perform such work subject to obtaining Landlord’s prior written approval thereof and compliance with the requirements set forth in this Section 4.3. If any unreasonable interference with Landlord’s Work occurs related to Tenant’s performance of such work, Landlord shall have the right by giving written notice to Tenant to end such Early Work and Tenant shall immediately cease such work until the Delivery Date, unless Landlord specifies an earlier date. If Tenant is granted the right to enter the Premises to perform Early Work, Tenant shall comply with all reasonable rules and regulations developed by Landlord related to such entry and the Early Work (including without limitation rules regarding timing and staging of Tenant’s Work). Tenant shall furnish evidence of insurance required under Section 9.2 and Exhibit "C" hereof prior to entry in the Premises to perform Early Work. Tenant shall not interfere or delay any portion of the Landlord’s Work while performing Early Work. Tenant shall only perform Early Work which is approved in advance in writing by Landlord and set forth in Tenant’s final plans as approved by the Landlord and all governmental entities having jurisdiction. Tenant shall only perform Early Work which is fully permitted by the City of __________ and fully compliant with governmental rules, codes, regulations and ordinances. (c) Landlord and Tenant are able to reach agreement, within ninety (90) days of the date Landlord receives the Extension Notice, for refurbishment of the Premises as described in Section 11.4 hereof. Landlord and Tenant shall use reasonable efforts and act in good faith in order to mutually agree prior to the end of the ninety (90) day period on the scope of the refurbishment. 4.5 Exercise Of Option. Tenant may exercise its right to so extend the Lease Term only by delivering written notice to Landlord of Tenant’s desire to so extend the Lease Term ("Extension Notice") no later than one hundred eighty (180) days nor earlier than two hundred forty (240) days prior to expiration of the Lease Term or Option Term as applicable ("Extension Notice Period"). (a) Within thirty (30) days of the date Landlord and Tenant reach agreement as to the refurbishment of the Premises, and provided all of the other criteria in Section 4.4(a) through (c) have been met, Landlord shall prepare and deliver to Tenant at least two (2) counterparts of an amendment to this Lease ("Extension Amendment"). The Extension Amendment shall provide for an increase in Minimum Annual Rent to the amount set forth in Section 2.1 hereof for the first Option Term or second Option Term as applicable. (b) Within thirty (30) days of delivery to Tenant of the Extension Amendment, Tenant shall execute and return to Landlord all counterparts of same. Landlord shall execute same and deliver to Tenant one (1) fully-executed counterpart original. 4.7 Time Of The Essence. Time shall be of the essence in regard to all of the periods set forth in Section 4.5 as to exercise of the Option, and in Section 4.6(b) as to execution and delivery of the Extension Amendment. The failure of Tenant to timely comply with any of the provisions of Sections 4.5 or 4.6(b) shall cause this Option to automatically cease and terminate and, in such event, this Lease shall terminate at the expiration of the initial Lease Term or immediately preceding Option Term as applicable, without extension.